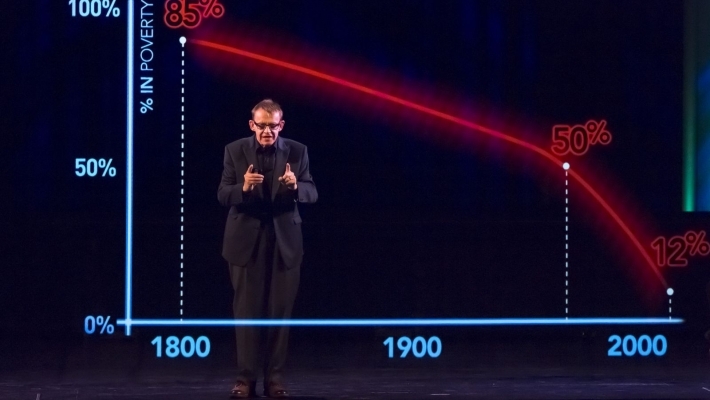 The legendary statistical showman Professor Hans Rosling is back with another high tech feast of facts and figures as he turns his attention to poverty and the extraordinary target of eradicating extreme poverty from the entire world. Don’t Panic: How to End Poverty in 15 Years, looks at the United Nation’s number one goal for the world: eradicating for the first time in human history what is called ‘extreme poverty’ – the condition of almost a billion people, currently measured as living on just a little more than $1 a day. Rosling once again uses holographic projection technology to wield his iconic bubble graphs and income mountains to present an upbeat assessment of our ability to achieve that goal by 2030. 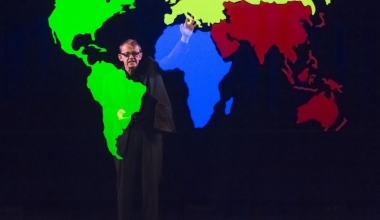 Eye-opening, funny and data-packed performances make Rosling one of the world’s most sought-after and influential speakers. For Don’t Panic: How to End Poverty In 15 Years he innovatively brings to life the chief target of the UN’s Sustainable Development Goals, the agenda for the world by 2030, interweaving powerful statistics with dramatic human stories from Africa and Asia. In Malawi the rains have failed as Dunstar and Jenet harvest their maize. How many ‘hunger months’ will they and their children face when it runs out? Meanwhile in Cambodia, Srey Mao is about to give birth to twins but one is upside-down. She’s had to borrow money to pay the medical and hospital bills. Might this happy event throw her family back into extreme poverty? The data shows, says Rosling, that recent global progress is “the greatest story of our time; possibly the greatest story in all of human history”. So arguably Don’t Panic: How to End Poverty in 15 Years is that most surprising thing, a feel-good programme about poverty. But Rosling also concludes by warning that the last lap is often the hardest. His parting message: that paradoxically it will be easier to eradicate extreme poverty quickly than slowly. Don’t Panic: How To End Poverty In 15 Years follows Rosling’s previous award-winning Wingspan productions Don’t Panic – The Truth About Population and The Joy Of Stats. It is part of the This World BBC Two strand and was produced in partnership with The Open University.